Our detoxification massage wrap is the ultimate in whole body detox, relaxation and rejuvenation. Our tables are heated, the room is comfortable with dim lighting and soft music. Honey Sugar Butter Scrub and a Sea Salt Lavender Mint scrub are used to remove the old cells and open up the new. While relaxing in the wrap you’ll be treated head to toe with a blissful Indian Head massage, a mini facial with the Vivier Vitamin C scrub and a foot massage. Hot towels are used to remove the scrubs followed by a soothing full body massage. The detoxification massage wrap is a massage/spa service. When booked with an RMT a massage receipt will be issued for insurance purposes. 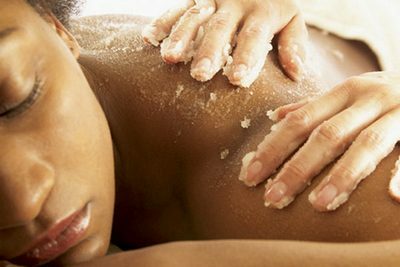 Be prepared to be totally relaxed and rejuvenated with our 100% natural, detoxifying and moisturizing massage.